We welcome you and your family to Clinton Bible Fellowship. Whether you are new to the area and exploring different churches, or if you are currently seeking a new church home, our desire is that God will lead you to where He desires you to be and where you can serve most effectively for the kingdom of our Lord. We will pray God gives you clear direction in this process. At Clinton Bible Fellowship, everything we do is driven by the Biblical mandate to make disciples by leading them to Jesus as their Lord and Savior (Matt. 28:19-20). We preach, teach and believe in the authority of God’s inerrant Word and His truths without exception. 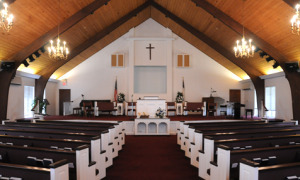 We invite you to join us for Sunday morning worship at 9AM or by listening to our services via our church website. Our website will help familiarize you with our church’s history, vision, beliefs, class availability and our Senior Pastor, Pastor Zack Furches.